When visiting Macao, lodge in licensed hotels or inns, do not stay in "illegal accommodation" operated without a license. "Illegal accommodation" premises usually have problems threatening fire safety, hygiene, building safety and security. For your own safety, never stay in "illegal accommodation". When an unlicensed inn is under investigation by law enforcement authorities, occupants must cooperate to provide relevant information. Occupants refusing to cooperate shall face a fine of $3,000 patacas. Tourists declining to pay the fine within the stipulated time shall be prohibited to re-enter Macao. Occupants providing false information are liable to criminal responsibility. 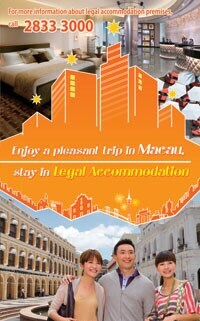 At present, there is no legal "family hostel" or "B & B" (Bed and Breakfast) in Macao. All legal hotels, guest houses or inns have a license issued by the Macao Government Tourism Office, and the license should be placed in the accommodation premise. In case of doubt about the legality of the premise where you are staying, please check with the Macao Government Tourism Office by calling +853 2833 3000.